Williston City Hall is located at 22 East Broadway, Williston, ND 58802; phone: 701-577-8100. 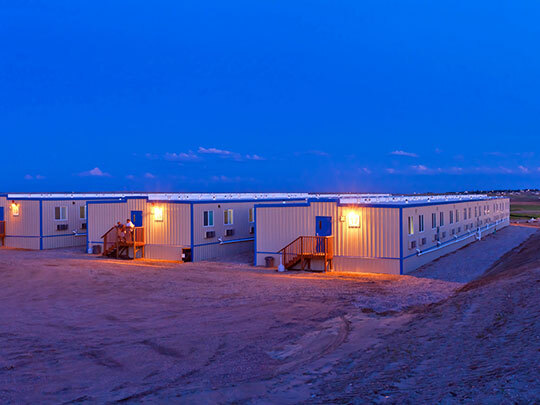 Photo: Bear Paw Lodge, Oil Worker Housing, Williston, Williams County, North Dakota. Photographed by user:Target Logistics (own work), 2011, [cc-by-3.0 (creativecommons.org/licenses/by/3.0)], via Wikimedia Commons, accessed December, 2013. Williston is located on the Little Muddy River which is a tributary of the Missouri River. Williston was named by James J. Hill, builder and first president of the Great Northern Railway, for his friend S. Willis James of New York City, who was one of the stockholders in the company. The James Memorial Library, corner of 7th Street and 1st Avenue West, is a gift of the James family. A large residential district and an active business district form the city, which is the Williams County seat and the trade center for a large agricultural area in northwestern North Dakota and northeastern Montana. It lies on a gravelly terrace between the lowlands of the Missouri River and the hills and prairies. The river, which at one time flowed at the foot of Main Street and now has cut its channel nearly a mile to the south, has played a prominent part in the history of the locality. Lewis and Clark came up the Little Muddy River in 1805 on their historic visit to the Pacific coast. In 1832 the Yellowstone, first steamboat to navigate the upper Missouri, passed the site, and by 1880 several boats were plying the stream. For 20 years after the 1863 gold strike in Montana, the river was a major channel of communication to the northwest. The first white settler in the vicinity was Robert Matthews, employed by the post traders at Fort Buford to cut hay for the cavalry horses. In the 1870s he established himself some distance below the present town, near where Stony Creek flows into the Little Muddy. Here he kept a stock of goods for sale, and often hired crews of woodcutters to supply the demand for fuel for the steamboats. A post office known as Little Muddy was established on his ranch. Although Matthews was the first permanent settler in the immediate Williston area, the first white man to settle in Williams County outside a trading or military post was George Grinnell. Born in Maryland, he served as a spy for General Philip H. Sheridan in the Army of the Potomac, was honorably discharged, and in 1865 accompanied a military wagon train from Fort Snelling, Minnesota, to Fort Berthold. The next year found him established as a "woodhawk," furnishing fuel to the steamboats, near the mouth of Dry Fork Creek, where he operated a saw mill until advised that he was on Government property. Part of each year he hunted along the Missouri, and for a time in 1875 was with a party of gold seekers in the Musselshell country of Montana. With the coming of the railroad Williston was moved to higher ground farther West. It was only a tent colony and a few log cabins when the rails were laid into it in 1887, and it was said to have had a saloon on each corner of its one business block, with seven or eight others in between. The late Joseph Stroud, pioneer Williston merchant, related that on the occasion of his first visit to the new town he was attracted by a large crowd of men on the street, engaged in rolling a man over a barrel. Inquiring of a bystander as to the cause of the man's accident, he was informed that the victim had taken a drink of water by mistake. By 1900 a steady influx of homesteaders into the Williston area had begun and by 1910 most of the desirable lands in the surrounding territory had been settled. Williston's population reached about 5,000 by 1915. An important factor in the rapid growth of the city was the location here of the division headquarters of the Great Northern Railway. The roundhouse, car repair shop, and huge ice house require the services of a large force of men. The railroad stockyards east of the city accommodate 93 carloads of livestock, and have loading equipment for 23 cars; many trainloads of western sheep and cattle are fed in transit. On several occasions a million bushels of grain have been handled at Williston in a year. The city is an important primary turkey market, and thousands of birds are shipped to holiday markets each year. The Farmers Educational Cooperative Union of America christened Williston the Cooperative City of North Dakota. The Farmers Union Cooperative Creamery, rated as the largest enterprise of its kind in the State, has its modern plant on West Broadway. The Farmers Union Oil Company Plant maintains a wholesale department for oils, tires, and binder twine, and has a tractor and farm machinery repair division. The Farmers National Warehouse Corporation Building, a concrete elevator with 217,000 bushel capacity, is said to be the largest cooperatively owned primary grain house in the United States. Newest of the cooperatives is the Poultry Plant on West 2nd Street, at the outskirts of the city.